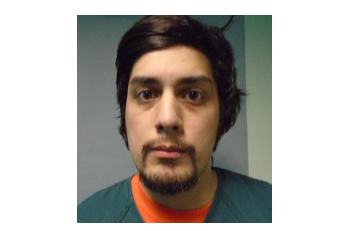 A Sitka man has been arrested for attempted murder. 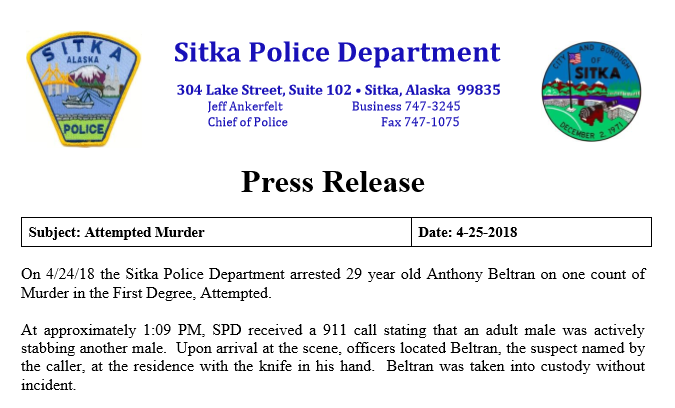 29-year-old Anthony Beltran was apprehended just after 1 p.m. on Tuesday afternoon, shortly after Sitka Police received a call from a woman who said her friend was stabbed multiple times by a man who was still in the home on Lance Drive. At his arraignment on Wednesday, Beltran said he moved back to Sitka from Oregon about a week ago and was not currently working. According to details in the complaint, read by Judge Rachel Jones, Beltran, McIntyre and Beltran’s girlfriend who called 911 were in the bedroom of the home, using methamphetamine. Beltran allegedly became suspicious of McIntyre for offering him bad drugs, and began to stab him with the pocket knife, aiming for the neck. Beltran’s preliminary hearing will be set for the early weeks of May, with bail set at $250,000- comprised of two different $125,000 bonds.